An updated 200k cue sheet has been posted on the website to incorporate the Trumbauersville Rd detour and to correct the departure route from the New Holland Control. Please be sure you get the revision dated 6/10/2017 (a browser refresh may be necessary). A pre-ride was completed on Friday, just in the nick of time for Saturday's start. Two road construction detours were noted. The first is along Rt 97 in New York between Hawk's Nest and Port Jervis, roughly mile 144 on the cue. Riders are advised to follow the car detour signs directing them left onto Bolton Basin Rd, right onto Rt 42 which then rejoins Rt 97 prior to the Port Jervis control. The second is near the Bloomsbury controle, roughly mile 222. Again riders are advised to follow the car detour signs and they will be returned to the route. Additional details will be provided at the pre-ride meeting. A final change, again due to road construction, was noted near the end of the route. This change affects both the 600k and 200k riders. The normal cue cue has a QL onto Trumbauersville Rd following the TR onto Upper Ridge Rd, but Trumbauersville is closed. Old Woods is the first left after going over the turnpike. You are back on cue after making the TR on Esten. Mileage will be slightly off. The 2017 ACP SR series concludes with the PA 600k scheduled for June 10-11 and staged from the Weisel Hostel outside of Quakertown, PA. The 600k route follows what has become a classic favorite traveling northward through Promised Land State Park to Hawley. From there the route follows the Lackawaxen River down the Delaware River at the Roebling Aquaduct where we enter New York with controls in Eldred and Port Jervis and the always scenic Hawk's Nest overlook. From Port Jervis, the route turns south through the Delaware Water Gap Recreation Area and eventually returns to Quakertown. 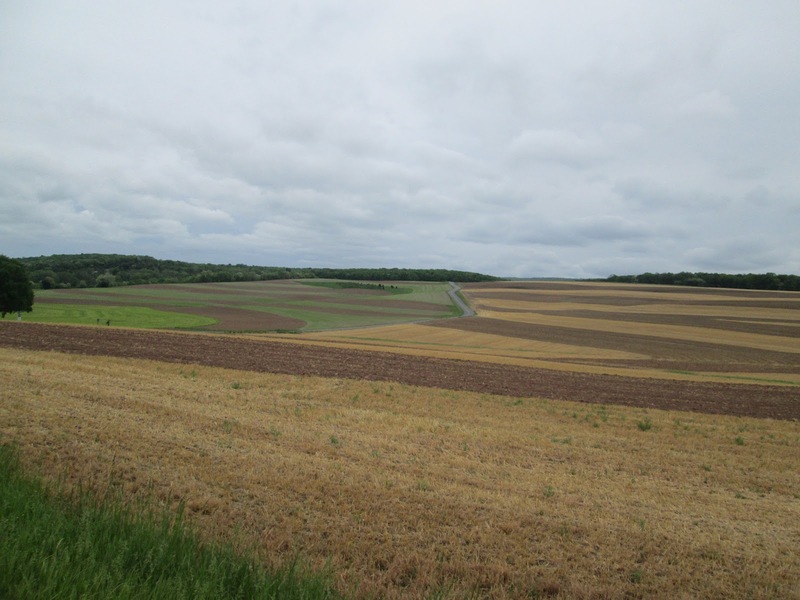 The second day features an out-and-back loop to New Holland. A 200k brevet will also be offered on Sunday June 11 covering the same loop as the second day of the 600k. Ride details have been posted on the website. Links to the route maps are also available. By all accounts the reverse running of the Blue Mountain 400 (dubbed Mountain Blue by some) was a success. There was a little rain and the winds were never really favorable all day, but all 18 riders who clipped in at Quakertown unclipped after negotiating 400 kilometers of viewing the Blue Mountain from all angles. Several riders finished in 20 hours or less, always a significant accomplishment, led by ultra-racer speedster Sean Connelly who flew around in 16:21. Just wanted to thank you and all volunteers, especially Guy H and Bill for such a great brevet. That was my first 400K and first ride west of the Little Gap. An excellent course and scenery. My favorite in the late evening view of Delaware Water Gap from Portland bridge. Also thanks to Eoghan for towing me from second controle to Wind Gap! Well worth the read as Aleksey had a little more excitement that he lets on. I took quite a few photos on Saturday, and uploaded some of them to Flickr. Please feel free to share as you see fit. After two separate course checkout rides with three sets of eyes, Rudi managed to find a remaining miscue in the cue sheet which resulted in an additional scaling of Second Mountain (that steep ridge to the north on the return legs). Sorry about that Rudi. Thanks to you (I understand how monumental of a task it is to rewrite an entire cue sheet) and all of the volunteers that put this ride on. It is definitely a huge sacrifice to donate your time to waiting around for hours for riders to come in. As was the case with the 300k, the forecast promised no rain and cloudy skies, and mother nature delivered wet roads and drizzling rain, though not enough to soak any of us through. I had the misfortune of breaking a spoke about 20 miles in. Sean gave me some electrical tape to keep the spoke from doing any damage, and I loosened my brake cable. But when we started up again, it was clear that the tire was rubbing the frame, so I told Sean to ride ahead and thanked him for his offer of help. It was nice in a way though because when I was just about done, CJ rolled up, and we had the opportunity to catch up all the way to the first controle. Sometime after this I caught up to Doug, and we rode about 50 or so miles together. I had initially thought about just trying to breeze through Blondies. Doug kept talking about egg salads and other great food there, and as we got closer, the idea of sitting down for a few minutes grew more and more appealing. 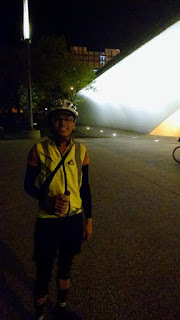 I had a great black and white milkshake with sweet potato fries that powered me through the rest of the ride. After the truck stop, I ran into Matt F. & co and briefly rode up ahead before they caught me again and helped me limp back to the hostel. Two things about the course that I think most people will have a similar opinion on: thank you, thank you, thank you for not taking us down Foul Rift Rd/River Rd after the crossing into Belvidere. Belvidere Rd was a bit more highly trafficked, but my legs were thankful for the gentler climb. Also, I definitely have a better understanding of the animosity that riders have for Gallows Hill Rd. I never thought it was all that bad, but riding on it in the dark after a day of hard riding really adds a whole other element to it. Finally, thanks to the organizing team of Bill Olsen, Guy Harris, and Chris Nadovich for pulling off yet another successful brevet. Volunteers Bob Torres and James Haddad also stepped up and pitched in to make sure things went smoothly and provide a little relief to the organizers. We all should appreciate their dedication to the event: Bob rode the initial course checkout ride on a cold, rainy day a couple weeks ago. James and Guy conducted a second check a few days before the brevet in 90+ degree heat. Next up is the 600k on June 10 with the 200k companion ride scheduled for June 11. We will be using the traditional 600k route and are currently checking cues and making our usual minor refinements based on lessons learned. Watch this space for more details. Two pre-rides have now been completed on the 400k route and one pre-ride of the 200k route. The cue sheets have been updated and posted on the website. Please make sure that you have the draft dated 5/19 for the 400 and 5/18 for the 200. James and I completed our pre-ride at 4:15 for a 24:15 total time. The story for us was the heat. James saw 94 on his Garmin. Only mid-70's at night. We were in a seemingly constant search for water. After Lickdale we just could not go the 50miles between controls without getting refills. I was still 4-5 lbs lighter than normal this morning. James though he went through 15-20 bottles with not much coming out. Same for me, plus a couple ice loaded quart sodas. Our ride time, on the bike, was 19:22 so we spent almost 5 hours off the bike!. The pizza place in Orwigsburg was a major culprit. Nice place, very air conditioned - probably an hour there. Next was > 1hour at Columbia - this is where we turned it into a mini-600 with what amounted to be a sleep stop. Residual effects of the day of heat. Reverse course - I like it. The section between Lickdale and Columbia is no worse in reverse. In fact, I think it is easier. The backloaded climbing exists mostly on ridewithgps IMHO. Ridewithgps is not a good indicator of the constant little bumps that make a ride like this challenging (again, IMHO). Climbing up to AT at Wind Gap was easy this way. Routing on 519 instead of Foul Rift, etc. from Belvidere a good choice to ease difficulty. But this was weekday at 2:00AM. 114.3-114.6 - the direct to go after crossing 443 is a little confusing; straight on is not thinking direction. Need to bear a little left and go down to get to Swatara bridge. Not sure how to cue this. Perhaps we leave it alone, should be obvious a bridge 0.3miles away is downhill? 165.1 - There is a deli in Bowmanstown. It is on left just after left turn onto White St. and before BR at 165.2 He is open until 9 PM Saturday. Minimal but has water, soda, sandwiches, etc. Finally, Swatara Trail. James had his wide tire 650B and I had 700x23. NO problems. I could ave. 11-12mph. It was dry though. There were some minor horsehoe divets in middle but could avoid all. We only saw two people on whole length but I am sure this changes on Saturday. The cue sheet has been updated to reflect the change at mile 33.8. The route at mile 114 is one of those that looks different from the ground. Once across SR 443 in Pine Grove, the route follows Mill St generally straight toward a bridge crossing the Swatera Creek. There are several side streets that intersect along the way, some in a bear right sort of way. Most are not marked. There is only ONE bridge across the Swatera Creek in this area, so if you've gone much more than a quarter mile after crossing 443 without crossing the creek, you're not on the right street. You should pass a public park on your right just prior to the bridge. A 24-hour diner allegedly exists in Bowmanstown (mile 165) as well as the deli. The diner remains unverified, but is something to keep in mind. It is noted on the cue sheet. Finally, please note that the 400k start time is 04:00 and that the 200k starts 2 hours later at 06:00. Thankfully, the heat looks like it will break for the weekend and provide near-ideal riding conditions. Still, if you take one thing from Guy's report, pay careful attention to your food & water. Options on the return leg are very limited, especially after 9pm. We will also be offering a 200k event for those not wanting to tackle the challenge of a 400k. Registration details for both rides are on the webpage. All in all, a pretty ride for the eyes but a hard ride for the body. With the 4 am start, the roads were pretty empty to deal with Ridge Road, some minor pot holes but nothing to worry about since I had plenty of room to avoid them with hardly any traffic on the road. Going east towards Lancaster was pretty nice and the further west I rode, I was able to enjoy it more when I got to the open farm lands. Most of the road traffic was in Morgantown but it was not too bad because the route goes back into the back roads to avoid most of the high speed traffic. From Morgantown to Jonestown was the flattest part of the entire ride. Around mile 90 is started to rain and the closer I got to Control #3, it rained the hardest. The roads for the most part was almost traffic free. Later while riding on Summer Hill Road and Crossing route 183 use extreme caution while crossing this road. This crossing is easier to do while riding the opposite direction but on this year's route, it is harder to see the oncoming traffic to your left and then to your right. So again use extreme caution. The next big crossing was onto route 61, watch out for high speed oncoming traffic to your left before making a right onto route 61 and then crossing over to the left lane. From here I was able to then make a left turn onto S. Liberty Street. At mile 150 stopping at Blondies to have a burger, fries and vanilla milk shake was a pleasure that I normally try to avoid. I was happy to sit down and enjoy my meal before pressing on for the final 100 miles. From here I basically just took my time, enjoyed the views, the rain was on and off but it was mostly light. Again for the most part of this part of the ride traffic was pretty relaxed and as the day progressed into night not too many cars to worry about. From Columbia to Quakertown the roads were pretty dead. Since I left Columbia after midnight I pretty much owned the roads. It is close to 50 miles to the finish from here so I highly recommend to carry an extra bar or two since everything is closed unless at mile 226 a left turn onto Route 173 and head to the Citgo in Bloomsbury might be an option to warm up or get something to eat or drink. This is not part of the route but keep it as a note just in case. Caution: On the cue sheet, mile 227.2 /T R onto Rt 639 / Warren Glen, the roads were rough, road work in progress. Looks like they are starting to resurface but not yet finished removing the top layer so we'll see what the next group on their preride will see. When getting ready to cross the Riegelsville Bridge the guard came up to talk and see why I was out so late. I told her of my mission and she really liked the whole madness. I told her that in two weeks she will see a bunch crossing so she is looking forward for that day. I was pretty happy to finish this ride on my converted 650b Trek 420 that I have owned since 1993. This bike has travelrf to many of the job's journeys in the past and hopefully I will complete the PA SR series this year on it. Another checkout ride for the 400k route as well a a checkout of the 200k route is scheduled for May 13. Check back after that for any updates. You may also want to spend time reviewing the route map. Services are rather sparse, especially in the second half of the route. We have marked services on the RWGPS map and on the cue sheet. You should also be aware that everyone's favorite family eatery, Blondies in New Ringgold is only open until 8pm on Saturday. The official control closing time is 8:12, so you may miss out if you're riding on the limit. We're hoping the relatively easier riding during the first 100 miles of this route will allow all riders to reach Blondies with plenty of time in the bank. Should you reach Blondies after closing time, make a note of the time on your card and proceed toward the 24-hour diner in Bowmanstown, 15 miles up the road. It is often said that the PA Randonneurs prepares its randonneurs for anything they might encounter in a brevet. This past weekend was no exception as PA regulars James Haddad, Chris Slocum and Bill Olsen completed the Carolina Spring 1200 Grand Randonnee in North Carolina. Conditions there were only slightly better than here: it was a little warmer, but the weekend was filled with lots of rain and lots of wind. 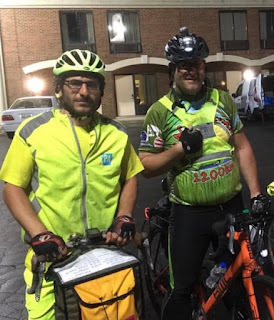 While it was "just another brevet" for Bill, though we are glad to see his return to form, it marks the first 1200k for both James and Chris. Congratulations to you all!! Crush the Commonwealth, Friday, April 28th to Sunday, April 30th, 2017. Was excited and nervous going into Crush the Commonwealth. Odds stacked in our favor: Eastbound = upfront climbing and tailwinds, plus the weather forecasts were calling for nighttime lows of 65 degrees, and mid-70s to 80s during the day. I’ve heard many horror stories from a PHL bike friend Eric G. about relentless rain, freezing temps, and strong winds going Westbound; no thanks. About 20-30 at the start, including PA Rando / CtC veteran Chris N., but unsure how many were there to “race” vs. how many locals to lead us out and see us off. Fun to mill about and meet some of the other riders; a quick look around indicated that touring/rando-types were in the vast minority, and most everyone were on road or gravel bikes with bikepacking saddle bags, frame bags, etc. Started shortly after 5am, and the large group immediately stretched out along the various trails leading to the GAP. 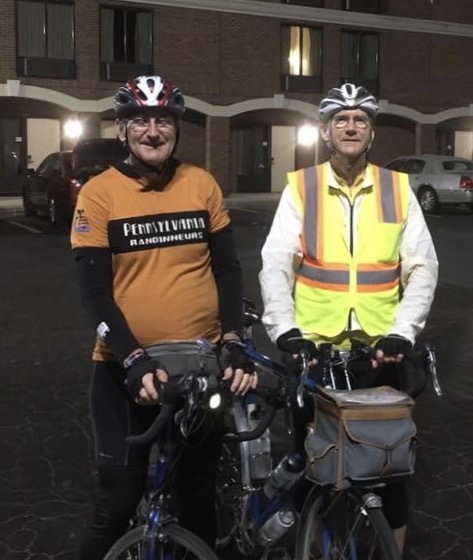 I told my long-time friend and roommate, Gary W., “This is probably the last we will see of any of those people.” I emphasized our need to just ride our own ride. Crush the Commonwealth would be Gary’s first ride over 150 miles, and I wanted to make sure I could see him through. After a few random water stops and getting on pavement(!) in Rockwood to join Bike Route S, our next proper stop was Somerset . Chris N. rode past, but we caught him and eventually passed him on the next fairly hilly stretch to Bedford. At this point, Gary had developed some stomach issues which dictated an emergency CVS stop. Dinner around 6:30 or 7pm at Subway, and we were back on the road, now as a group of 5-6 after linking up with a few PGH-ers, who we subsequently dropped on the first climb and then never saw again. Night fell and we managed to get to Breezewood [~175; sometime before 9pm]. Really crappy to ride through. We saw 3 riders ahead getting honked at, but luckily it’s not very far to get to the abandoned turnpike. Our new crew of 5 enjoyed the tunnels a lot, but hated the busted pavement sections between. Even with 5 lights, hard to navigate, and we were all thankful that no one flatted during this section. I’ve heard many times that getting to this section in daylight can be crucial if you’re actually racing. Gary and I stopped at Sideling Hill [185, 9:45pm] before the long push to Chambersburg . I love PA Turnpike rest stops and thoroughly enjoyed the rest time, knowing that a warm shower and a bed were waiting after Cowan’s Gap. It started to drizzle during this leg, but it was warm enough that we didn’t need layers. Gary got pretty quiet and we weren’t feeling that great, but we managed to make it to Rt. 30 and felt much better being back around civilization. A stop at Sheetz to get a few hotel room snacks, and we were checked in, showered, and asleep by 2:45am. Loose plan was to wake up 5am, eat breakfast at Chambersburg Diner, and start rolling at 7am. That plan went out the window when we woke up at 6:57am. We got dressed and looked outside; apparently a huge storm rolled through and we had managed to miss nearly all of it. We would later find out that groups both ahead and behind us got stuck in torrential storms and would eventually DNF after having to sleep outside or pushing too hard and burning out. After a relaxed breakfast at the diner, we rolled out into light drizzle around 8:45am for 40 miles to East Berlin. The sun came out, we had a tailwind, and we were on smooth pavement. Everything was going swimmingly, until I realized I had dropped Gary, hard. After getting him back, he dropped the bomb that he was going to abandon, about 35 miles into Day 2. I tried to talk him into pressing on, but he was steadfast. It didn’t help that we were at Rutter’s, which is MUCH nicer than Sheetz, and definitely wins my vote for “best not-Wawa convenience store”. A super-nice dining area, upscale finishes, a shower stall in the spacious bathroom…. All in the size not much larger than a Super Wawa. A++!! But I digress. I refueled, we said our goodbyes, and I pressed on. Noon and 200k left to go for me. The early stop threw off my planned segments the rest of the day. The sun was also beating hard, so I stopped early at Roburrito’s York, force fed a burrito and tons of ice water, and laid down for awhile in a booth, much to the dismay of the staff and maybe some of the other diners. Burnt up and my skin hurt; the sunscreen I had bought and had been reapplying all day had just been sweating off, or terribly ineffective, or both. After an hour of collecting myself, continued around 3pm. Section through York, Columbia, and Lancaster wasn’t great. At least there’s a shoulder? But as I got through familiar territory/undergraduate stomping grounds, a bit of a morale boost. However, after checking the internet, I found out that the one person I knew behind me has leapfrogged me at York, and I was now lanterne rouge (for the two-day riders at least). I decided to ride past Lancaster and stop at the Turkey Hill at Jct. 340. 5:45pm, and I had about 2 hours of daylight to make the next ~25mi stretch to Morgantown, my last planned stop before Philly. 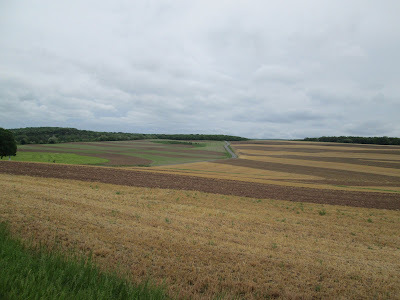 Was enjoying Lancaster County farmlands, but eventually this section got pretty demoralizing, as it felt like everything just looked the same. A car passed me and then pulled over to flag me down. It’s Clair Beiler! He recognized my PA jersey and figured there was a very good likelihood he’d know who it was. He was my assigned-by-Tom riding partner for my very first brevet in 2013. It was great to catch up and inform him of what exactly I was doing in his neck of the… farms since seeing him so long ago. A much-needed boost, as I had only been talking to convenience store employees all day. Morgantown Sheetz at 8pm on Saturday. Was determined to make it different this time around: On the 400k, I crawled back the 50 miles to the hostel on what was (and still is) the hardest ride I’ve ever done; on the 600k, I was again bonking and barely made it to the Blue Ball turnaround by closing time. But this time, I relaxed, making sure to eat as much as I could comfortably to get me to Valley Forge. Back on the road at 9pm. No cut-off time = no pressure. Quick work of Rt. 23 and was so glad to be getting closer. However, some missing Bike Route signs near VF had me second-guessing my GPS and consulting my phone. Eventually, I found my way on Pawlings Road, and laughed at fact I was semi-lost maybe only a quarter-mile from the SRT, my red-carpet home. Weird things on the trail late at night, especially around Norristown and Conshohocken, but otherwise was in the drops hammering away all alone. Made the mistake of thinking it would be better to ride on road through Manayunk….. at midnight. D’oh. One block of that quickly set me back on the towpath as far as it goes. The Parkway was closed due to the NFL Draft, so I ended up hopping off at Race St., then onto Market for a “proper” ride around City Hall and then to Independence Mall. Arrived at 12:57am Sunday [43:57], snapped a few pictures, and then sat down reeling. Did I really just ride from Pittsburgh to about a mile from my house in 44 hours? Really glad to have finished Crush the Commonwealth. Experienced so much of my home state by bike, and met a ton of new and interesting people that might never come out for an official brevet. Also something to be said about the straightforwardness of the ride: Outsiders can grasp the distance between Pittsburgh and Philadelphia, vs. telling friends and co-workers “400km” or “600km”. After scouring around, found out there were basically 3 groups: the one-day racers (sub-30), the two-day randos (35 – 45hrs), and a few three-day tourists (60hrs) including Chris N., who had decided to break off at Morgantown to get to Easton. I don’t blame him at all for riding straight to his house; that’s exactly what I did. Congratulations CJ, and thanks for the story.